Do you try to play the hero when you’re ill — dragging yourself into work even when you feel like collapsing? Or do you tend to fold at the first sneeze? Neither approach is optimal. 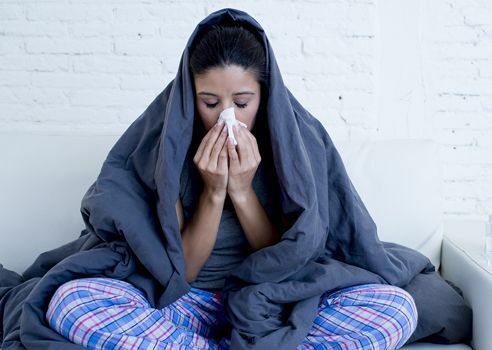 Here are 7 ways you can be more productive when you’re sick…. Brace yourself for some nasty illnesses this year. Australia, Hong Kong and other spots in the Southern Hemisphere have already faced one of their worst flu seasons on record. For those of us who live in the North, this news is a harbinger of what’s likely to happen during our own winter. Start washing your hands, now! Stay away from other people. If you work in an office, don’t become a disease vector to your coworkers. Every surface you touch — doorknobs, desktops, phones, keyboards, pieces of paper — will become covered with cold or flu virus you’ve shed. When I used to share a desk with someone (on alternate days), I’d take in a spray can of disinfectant and wipe down our entire office whenever my coworker had been sick. Dragging yourself into work when you’re ill is only likely to make other people sick, too. And be equally mindful about the downside of sharing germs if you already work from home. Don’t go out to conduct interviews because it will mean sharing your bug with others. If there’s something so important you can’t miss it, arrange to do the interview by phone instead. Don’t treat illness as an all-or-nothing proposition. From time to time, we may all get really sick and be unable to do a single thing. But let’s be honest: that’s rare. More often, we’re too sick to go into work but we end up spending six hours in front of a Netflix screen. Doesn’t that get boring? Instead of zoning out with easy entertainment, challenge yourself to do small amounts of work, as long as you feel up to it. Make a list. We all accomplish more when we make a plan for how to spend our time. This becomes even more important when we’re sick. Gauge how much energy you have and decide how much you will be able to work on this sick day of yours. If the answer is 45 minutes — of what would otherwise have been an eight-hour day — so be it, but make those 45 minutes extra worthwhile. Write down ALL the things you need to do and then circle the ones that are most important. Figure out how much time each will take (be generous with the time estimates – after all, you’re sick and you’ll be working more slowly than usual) and then schedule them into your day. Delegate as much as you can to someone else. And if you’re a freelancer, that might mean delegating to yourself when you’re well again. Work in short bursts, using a timer. You won’t have your usual energy when you’re sick so don’t expect to be able to conduct meetings from your bed or to churn out a 1,700-word profile. But you can likely do small, discrete jobs. This is a great time to use the pomodoro method — bursts of 25 minutes focused on one task. After you’ve logged your pomodoro then take a five-minute break. And be sure to use a noisy timer to track your activity. The tick-tock of the clock will help keep you focused. After you’ve done a few pomodoros, reward yourself with a glass of ginger ale, a nap or a show on Netflix. Focus on easy, mindless tasks. Ok, so your brain isn’t working so well right now. But don’t you have plenty of work that you otherwise never have time for? What about cleaning out or reorganizing your inbox? What about thinning all the junk that’s cluttering up your cell phone? Do you have any old papers you can shred? Any filing you can do? What about typing up some interview notes? Not all work requires 100% mental acuity. So, do the “easy” stuff now. Read. For me, the best part of being sick is the chance to read more. I have a Kindle so I can even order books from my bed. You may not have the mental attention to get through a challenging non-fiction work but surely you can read a light novel? For my recent book recommendations, look here. Otherwise, check out the New York Times bestseller list, The New York Review of Books, The London Review of Books, Kirkus Reviews or NPR. Plan for the future. Many of us don’t have nearly enough time to plan. We get caught on the gerbil-wheel of constant activity, forgetting to evaluate what’s important to us and what our major goals are, whether personal or professional. As you zone out in bed, you are in the perfect position to let your mind wander. Cognitive scientists (and engineers, such as my friend Barbara Oakley) call this the diffuse mode. It’s all about enjoying distractions and making connections at random. When you’re healthy and working at 100% you might not have time for this. But now that you’re sick, yahoo! You do. Take the time to let your mind roam and think the “big thoughts” that will help you make better plans for the future. Being sick is no fun, but it doesn’t have to be a total waste of time, either. While your body does the necessary job of healing, your mind —no matter how fuzzy — can probably accomplish a few worthwhile tasks, as well. My 4-minute video podcast last week considered the question of when it’s wise to talk about your writing. See it (with a transcript) here and consider subscribing to my YouTube channel. If you have a question about writing you’d like me to address, be sure to send it to me by email, Twitter or Skype and I’ll try to answer it in the podcast. What do you do when you get sick? We can all learn from each other so, please, share your thoughts with my readers and me in the “comments” section below. Anyone who comments on today’s post (or any others) by Nov. 30/17, will be put in a draw for a copy of Metaphorically Selling by Anne Miller. Please, scroll down to the comments, directly underneath the “related posts” links, below. Note that you don’t have to join the commenting software to post. See here to learn how to post as a guest.